Democracy icon Aung San Suu Kyi will spend another 18 months as a prisoner of Burma’s military junta, a Rangoon court decreed today. She was found guilty of violating the terms of her house arrest after an American man called John Yettaw swam to her lakeside house in Rangoon in May. Yettaw, who has been in poor health, was sentenced to seven years in prison with hard labor. The Nobel Peace Prize laureate was initially jailed for three years with hard labor until a special order from junta chief General Than Shwe was read out in court commuting her sentence to 18 months under house arrest. The verdict has prompted further global outrage and renewed calls for stronger action against the dictatorship. Suu Kyi has already spent more than 13 of the past 20 years in jail or detention. The verdict was delayed, apparently while Burma’s generals calculated the likely domestic and global response to its continued persecution of the world’s most famous political prisoner. The junta’s idea of lenience  an 18-month sentence  is long enough to keep Suu Kyi in custody during a 2010 election which will formalize the military’s grip on power, but shorter than the maximum sentence of five years in the notorious Insein Prison. “The generals are trying to manage the anger of both the international community and the people of Burma,” says Win Min, a Burma analyst at Payap University in Chiang Mai in neighboring Thailand. The attempt will probably backfire. The verdict is likely to cripple the prospect of better relations with the U.S, which had tied an ongoing review of its pro-sanctions policy to Suu Kyi’s release. “The door remains open for the regime to respect the wishes of the Burmese people and international community,” the U.S. State Department said in a statement last week. Today’s decision has apparently slammed that door shut. British Prime Minister Gordon Brown called the verdict “monstrous” and urged the United Nations Security Council to impose an international arms embargo on the regime. Malaysia’s Foreign Minister Anifah Aman expressed “grave concern” over the verdict and called for an urgent meeting of his counterparts in the Association of Southeast Asian Nations, a regional organization that is usually supportive of Burma. A global arms embargo is “the most effective way of showing this military dictatorship that it can no longer defy the international community,” says Zoya Phan of London-based advocacy group Burma Campaign. Local outrage has been necessarily muted, what with 2,000 police and militiamen at the prison to prevent any protests. Since 2007, when monks led an abortive uprising, Burma’s opposition has been all but neutralized by a pitiless campaign of arrests and lengthy sentences. The outcome of the trial was unsurprising. 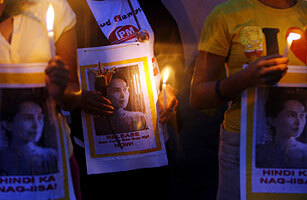 “I’m afraid the verdict will be painfully obvious,” Suu Kyi was heard to say in court last month. But she isn’t going to prison. According to recent reports, she was stockpiling Winston Churchill’s biographies and other books in anticipation of jail time. “If you are going through hell,” Britain’s wartime leader famously said, “keep going.” Suu Kyi and her supporters can do little else. See pictures of tension in Burma.